I’m a big fan of top-down arcade racers. The short tracks, speed boosts, and tight races create a kind of intensity that I find hard to replicate in other, more traditional racing games. Enter Mini Motor Racing [$1.99 / HD], the latest from The Binary Mill, and a good example of why I love top-down racers. Everything from the visuals to the great presentation and large amount of content outweigh the physics issues and occasional stability problems, making this a highly recommended game for racer fans. The first thing you’ll notice when you jump into a race in Mini Motor Racing is the high quality visuals. Both the vehicle models as well as the actual tracks look great and it all runs at a fast framerate. Added touches like weather conditions (the rain looks great) do a good job making the game come alive. In addition, Mini Motor Racing also features a rocking soundtrack that I thought added to the feel of the game. All of these elements combine for a smooth and engaging presentation that simply adds to the overall experience while playing. 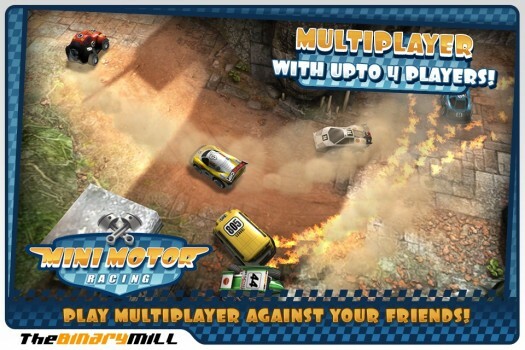 Gameplay-wise, Mini Motor Racing plays great and features tons of content to keep you playing for quite a while. Like most racers, each race is a quest to finish first, with the higher your position, the more money you earn. That money can in turn be used to upgrade your vehicle, giving you a better chance to beat later cups and tracks. While upgrades go a long way towards track success, a lot of the strategy in Mini Motor Racing involves memorizing track patterns and understanding the intricacies of the physics of each map. Of course, you could always just spend some money on IAP cash and immediately upgrade the hell out of your racer. Mini Motor Racing includes both a quickplay and career mode. The career mode features the vast majority of the content and has dozens of maps separated out into quite a few cups. True, a lot of the tracks are reused with mirroring or different weather conditions, but the game does a great job altering camera angles to make each version look adequately different. This is one of the few racing games I’ve played where I didn’t feel like I was playing the same maps over and over again with little change. There’s also a multiplayer mode, but it is restricted to local play currently (something I hope is addressed in future updates). One of the biggest elements that can make or break any racing title is its controls. Thankfully, Mini Motor Racing looks to address any potential control issues with a wide variety of options. The default control method is the ‘wheel’ which places a small steering wheel in a corner of the screen that you drag to steer. Other options include simple left/right toggle options and the slider, which is a control method I still can’t get used to. Each control scheme works well enough meaning that it’s really up to the player to choose the one that feels the most comfortable (although I felt the wheel offered the most precise control out of all of them). Regardless, it’s nice to play an arcade racer that offers a variety of controls that work. While there are plenty of reasons to love Mini Motor Racing, there are a few issues that hold the game back from perfection. While the physics engine adds personality to the gameplay, there are some occasions in which your vehicle will interact with the environment in ways that don’t make sense. This is exasperated somewhat when you get to later levels and the AI begins headhunting for your vehicle, slamming you into walls and into other cars which makes it very hard to take first place. In addition, there have been reports of instability in earlier iPhone/touch and iPad generations, causing lots of crashes. While I personally haven’t had these issues on my 4S, the problems seemed widespread enough to mention. Luckily, The Binary Mill has already begun to address these issues, with a recent update expanding the width of certain tracks as well as addressing the stability problems. Despite these issues, I love Mini Motor Racing and feel that it’s a worthy candidate for being one of the better arcade racers currently on the App Store. Not only are the gameplay elements sound, there’s tons of worthy maps and content that’ll keep you coming back. Furthermore, recent updates to the game show that the developers are willing to put the effort necessary to smooth out any issues. Simply put, if you’re a fan of top-down racers, definitely check out Mini Motor Racing.